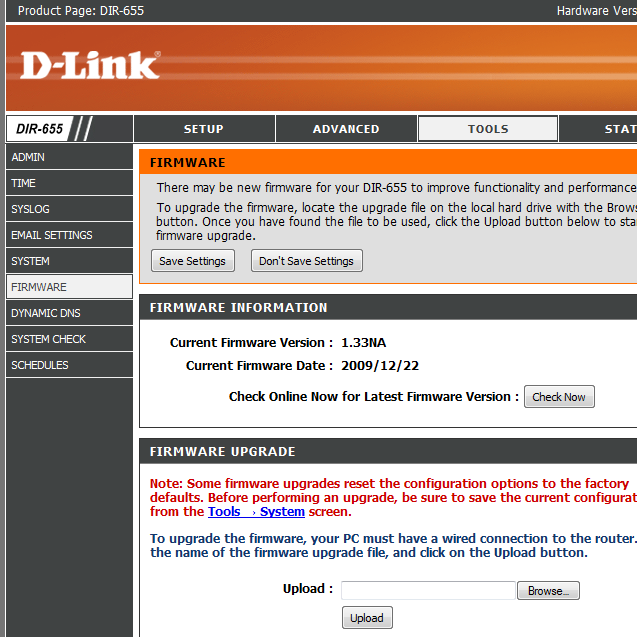 Update 22-04-2010: D-Link have released the 1.34b03 firmware that fixes an issue with the statistics page for this firmware. Get it here. 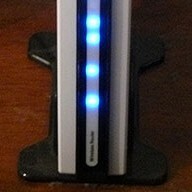 D-Link has released the 1.34b02 Beta firmware for the DIR-655 router. This code addresses disabling the SecureSpot feature. The router will not query Bsecure when the feature is disabled. D-Link has also released SharePort version 3.0 for Mac OSX and Windows. There doesn’t appear to be a changelog but I will add one if it appears. Add a comment below with any results you have regarding these. D-link have released a new beta firmware for the DIR-655 in the hopes that it will fix an undisclosed SharePort issue. I don’t know what SharePort issue they are referring to and I have not tested this myself. Once again this firmware WILL NOT DOWNGRADE to pre 1.3x firmwares so if you are on a pre 1.3x firmware then it is suggested that you stay put because chances are you will only have more issues and you can’t go back. This firmware is beta, it is a test release, it may break/brick your router for no reason. As the changelog suggests there is a new SharePort utility included that will supposedly only work with this version, I don’t know if SX Virtual Link works with this firmware, but for the record it has a version number of 5.6.2 making it newer than SX Virtual Link. Update 27th of October 2009: I have decided to test this firmware out as some users have reported that there are some small wireless improvements, I will leave any findings in the comments below. I will also try a SharePort stability test as the longest I have been able to keep a single SharePort connection alive has been about half an hour. Update: D-Link has released a new firmware for the DIR-655 here, it contains a version of SharePort that is newer than SX Virtual Link. I haven’t been following D-Link’s SharePort fiasco since the first few months of my previous blog posting about it here. This is due to the fact that as many users have experienced since the original release it appears to have gained more and more bugs in each new version and we only occasionally see them being fixed. A forum post in the official D-Link forums about the Apple OSX users of the software pointed me to the fact that the drivers and software used to connect to the router appears to have been made by a company called Silex Technology. I searched around and found SX-Virtual Link, the original name of the D-Link SharePort Utility, upon downloading and installing the latest version 3.2.3 I found that the application was the same as the SharePort Utility except for the branding and the version. D-Link’s latest SharePort Utility has the date 2009/01/06 and theirs is 2009/02/02, there is also a major version difference, the specific version number for the utility/drivers with SharePort is version 4.9.5 and SX-Virtual Link is up to version 5.3.0. Upon using the utility I had no problems at all connecting to my D-Link DIR-655’s device, I used a wireless mouse to test the functionality and it worked flawlessly for some time, so I am encouraging users who currently have issues with SharePort to uninstall it and install SX-Virtual Link and see if it fixes any of the issues you are currently having with your devices. For OSX users I have not been able to test out the OSX version and I am unaware of any changes you might need to make to get it working but I will provide a link below for those users to test if they so wish. Please comment below with your experiences. Update: D-Link has released a new beta firmware for the DIR-655 here, it ONLY fixes *a* SharePort issue. 5. Fixed QRS issue, can’t set up wireless setting. So far it appears that the DNS Relay lockup bug has not been fixed, SharePort is still acting up for users and in some cases even worse, some people report smoother file transfers however.